Our newest service offering focuses on optimizing resource productivity. It draws on our MetaFlowScopeTM technology to analyze the flows of materials and energy through a business/factory/process, quantify the economic and environmental impacts of resource use, and find opportunities to increase resource efficiency while reducing costs. We live in a resource-limited world. And yet, according to the EPA, US industrial facilities generate 7.6 billion tons of industrial solid waste each year. Much of this is non-hazardous waste including materials that may have value in other applications, but most businesses do not have an analytical method to evaluate the economic and environmental values of their waste streams. In addition, food waste is a serious problem in the food service industry. Waste reduction alone could yield annual savings of hundreds of billions of dollars in the US economy and cut national GHG emissions by 5-10%. Scope 3: Pivoting to Material Efficiency. 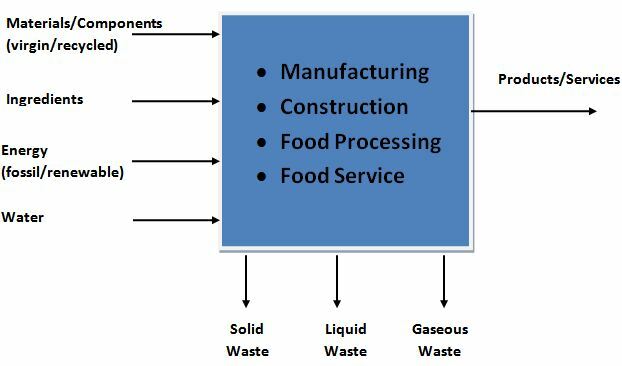 As the diagram below illustrates, we view a business operation or process in terms of its metabolism: the flow of materials and energy. MetaFlowScopeTM translates this to rigorous analysis using a unique combination of technologies and methodologies including material flow analysis, industrial metabolism, life cycle assessment, and value chain analysis. Our analysis will provide insights into the compositions and potential values of various waste streams so that a company can decide how much effort it should put into recovering certain wasted materials that may have a market value. Preventing that waste in the first place may have an even bigger impact on the bottom line. But not all waste is the same: some waste materials will always have higher economic and environmental values (or environmental impacts) than others, so businesses need to decide which ones are worth optimizing. Our analysis will help prioritize material use and waste by quantity, economic value and environmental value. Waste outputs are not the only issue: resource productivity can be boosted by better choices of raw materials and energy sources, changes in manufacturing operations including efficiencies, alternative product packaging and distribution, and many other such initiatives. After completing a baseline analysis, we will work with you to select and run a series of “what if” explorations of economic and environmental costs and benefits of alternatives at design stage (material substitution, energy requirements), manufacturing stage (process optimization, energy conservation, energy substitution, waste reduction, internal recycling of materials and energy), procurement stage (recycled content, choice of suppliers, etc. ), distribution stage (packaging, transportation and logistics), and disposal stage (material recovery for reuse/recycling, landfilling, product end-of-life handling) – all with the single purpose of helping your business deliver the same outputs at a lower economic and environmental cost. © Copyright 2007-2011 by CleanMetrics Corp. All rights reserved. ghts reserved.